While in the service of Spain, the Portuguese explorer Ferdinand Magellan led the first European voyage of discovery to circumnavigate (travel around) the globe. His voyage provided clear proof that the Earth is round. Ferdinand Magellan was born in Oporto, Portugal, in 1480. His parents were members of the Portuguese nobility, and the young Magellan found himself in the service of royalty at an early age. He was only twelve when he began serving the queen of Portugal as a page, a position of employment for youths in royal courts. As a young member of Queen Leonora's School of Pages in Lisbon (the Portuguese capital) Magellan was encouraged to learn subjects that would aid him greatly later, such as cartography (mapmaking), astronomy, and celestial navigation (learning how to steer a ship based on the positions of the stars). Magellan joined the Portuguese service to sail with the fleet in 1505. He went to East Africa and later was at the battle of Diu, in which the Portuguese destroyed the Egyptian fleet's dominance in the Arabian Sea. He went twice to Malacca, located in present-day Malaysia, and participated in that port's conquest (the act of conquering) by the Portuguese. It is possible that he also went on a mission to explore the Moluccas (islands in Indonesia, then called the Spice Islands). Trading in spices brought great wealth to European nations at this time, and there was much competition among them to claim territories that were rich in spices, especially in Southeast Asia, called the East Indies. The Moluccas were the original source of some of the world's most valuable spices at that time, including cloves and nutmeg. In 1513 Magellan was wounded in a battle in North Africa. But all of his services to Portugal brought him little favor from the Portuguese king, and in 1517 he went to Seville, Spain, to offer his services to the Spanish court. direction from Europe, thus traveling around the globe. Other explorers had paved the way for Magellan by making key mistakes and discoveries. Christopher Columbus (1451–1506) had badly underestimated the distance between Europe and the East Indies, sailing westward from the European coast and "discovering" North America and the Caribbean islands (West Indies). 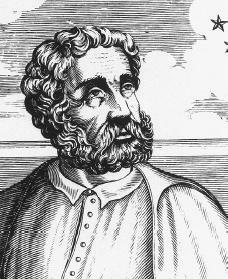 Vasco Núñez de Balboa's (1475–1517) march across the Panamanian isthmus had revealed the existence of the Pacific Ocean, which he had claimed for Spain. Thereafter, explorers eagerly sought northern and southern all-water passages across the Americas to reach the spice-rich East. Magellan also sought such a passage. King Charles V (1500–1558) of Spain approved Magellan's proposal, and on September 20, 1519, Magellan led a fleet of five ships out into the Atlantic. Unfortunately, the ships—the San Antonio, Trinidad, Concepción, Victoria, and Santiago —were barely adequate to sail, and the crew were not all firmly loyal to their leader. With Magellan went his brother-in-law, Duarte Barbosa, and the loyal and able commander of the Santiago, João Serrão. Arriving at Brazil, the fleet sailed down the South American coast to the San Julián bay in the region called Patagonia. They stayed there from March to August 1520. During this time an attempted mutiny was put down, with only the top leaders being punished. Afterwards, however, the Santiago was wrecked, and its crew had to be taken aboard the other vessels. Leaving San Julián, the fleet sailed southward. On October 21, 1520, it entered what is now called the Strait of Magellan (the channel of water between the southern tip of South America and the island of Tierra del Fuego). The fleet proceeded cautiously, taking over a month to pass through the strait. During this time the master of the San Antonio deserted and sailed back to Spain, and so only three of the original five ships entered the Pacific on November 28. A long voyage northward through the Pacific followed, and it was only on March 6, 1521, that the fleet finally anchored at Guam. Magellan then headed eastward to Cebu in the Philippines, where, in an effort to gain the favor of a local ruler, he became involved in a local war and was killed in battle on April 27, 1521. Barbosa and Serrão were killed soon afterwards. The remaining crew were forced to destroy the Concepción, and the great circumnavigation was completed by a courageous former mutineer, Juan Sebastián del Cano. Commanding the Victoria, he picked up a small cargo of spices in the Moluccas, crossed the Indian Ocean, and traveled around the Cape of Good Hope (at the southern tip of Africa) from the east. He finally reached Seville on September 8, 1522. In the meantime, the Trinidad had tried to head back across the Pacific to Panama but was finally forced back to the Moluccas. There its crew was jailed by the Portuguese, and only four men later returned to Spain. Magellan's project brought little in the way of material gain to Spain. The Portuguese were well established in the East. Their route to the east, by way of Africa, had proved to be the only practical way of getting by sea to India and the Spice Islands. Yet despite nearly destroying itself in the process, the Magellan fleet for the first time revealed in a practical fashion the full extent of the globe. As a scientific effort, it proved to be the greatest of all the "conquests" undertaken by the overseas adventurers of fifteenth-and sixteenth-century Europe. Guillemard, Francis H. H. The Life of Ferdinand Magellan. New York: AMS Press, 1971. Meltzer, Milton. Ferdinand Magellan: First to Sail Around the World. New York: Marshall Cavendish/Benchmark Books, 2001. Nowell, Charles E., ed. Magellan's Voyage Around the World: Three Contemporary Accounts. Evanston, IL: Northwestern University Press, 1962. Stefoff, Rebecca. Ferdinand Magellan and the Discovery of the World Ocean. New York: Chelsea House, 1990.
need more details about childhood/adulthood and ALL the things that happened in his life. this site was very helpful!!! than you it has helped me pass world civ with flying colors!!! i love ferdinand!!! he is awesome!!! this is my great millions of times over grandfather... o my goodness. in my family they tell story's all the time. its wonderfull to learn about your family. my moms maiden name was Magalhaes,my grand-father swears he is a direct desendant af Magellan. this is so interesting to me. I would love to learn more. who is his father in law? AND ALSO THE NAME OF HIS WIFE?